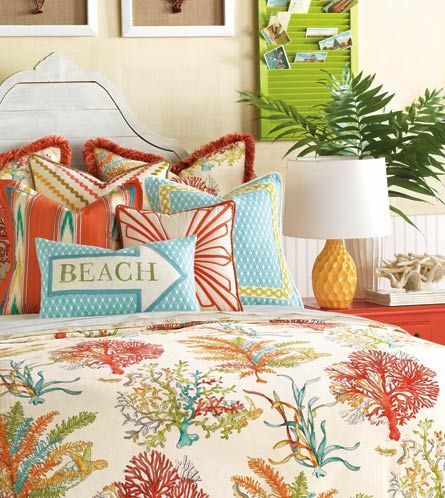 I’m loving all these beach bedding collections. They’re inspired by warm ocean waters and gentle breezes, sandy beaches, colorful sea life and island destinations. At the end of the day, slip away to a beach oasis! Eastern Accents Maldive Collection from Wayfair features the tropical palette of turquoise lagoons, pink coral reefs, and white sand beaches. Simply delicious. Blue Seashell Comforter Covert and Blue Seashell Sheet Set from L.L. Bean’s Bedding Collection. A subtle crisp design with a distinct seaside vibe. 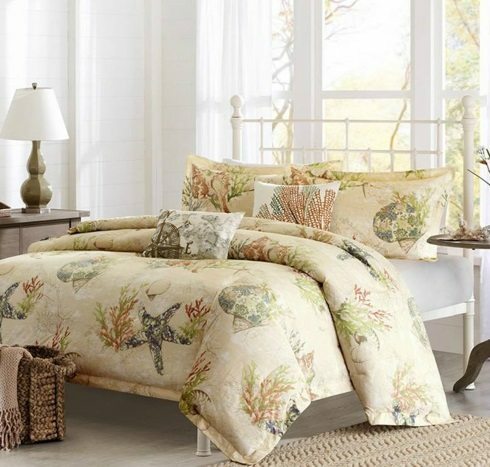 The Jamaica Comforter Set from Hayneedle is all about the warm palmy feeling I so love, captured in a stylish and elegant way. 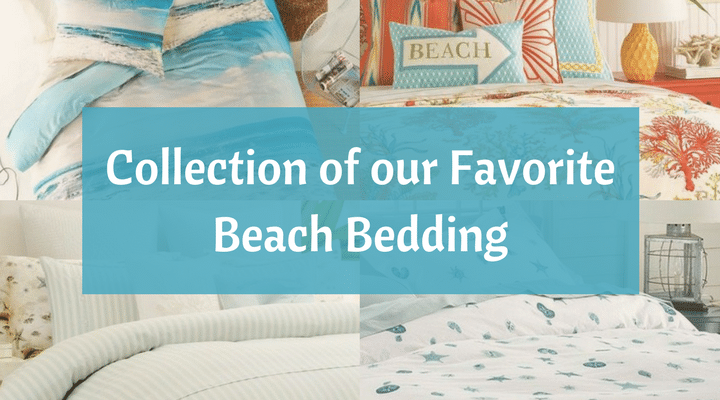 Make sure to check out their entire Beachy Bedding Collection! With Pottery Barn’s Atlantic Duvet Cover and Sham you get the colors in soft shades. I’ve always loved this design. Kohl’s Coral Quilt Coordinates are sandy and soothing. They have a variety of other beach theme designs in their Quilt Set Collection that you might want to check out! 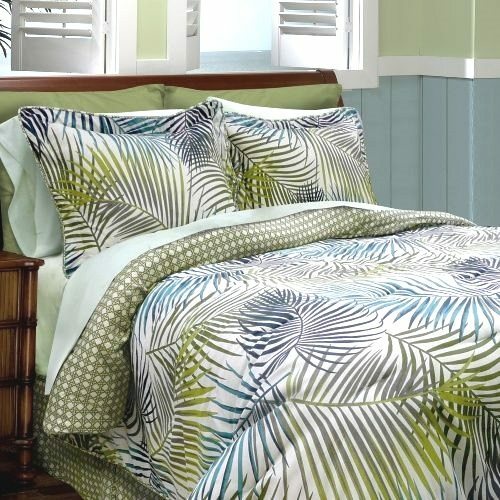 Tommy Bahama Surfside Comforter Set is inspired by the water of the Caribbean. I love the soft ticking stripe duvet cover. This is a closeout sale at Macy’s. 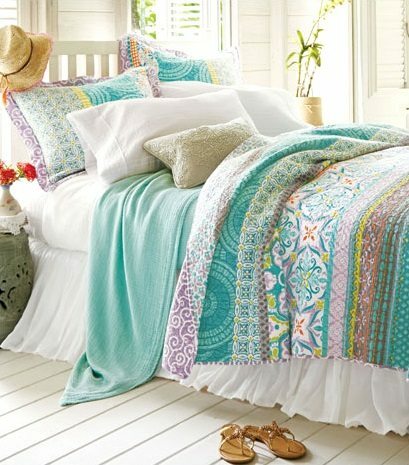 The Jolie Bedding Collection from Frontgate is another beautiful vibrant beach bedding ensemble. 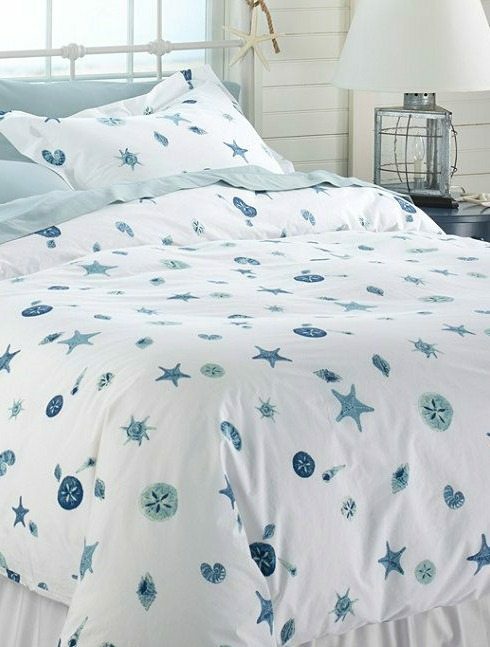 Make summer last forever with this Aqua Sea Glass Coral Reef Bedding from Summers at the Cottage. 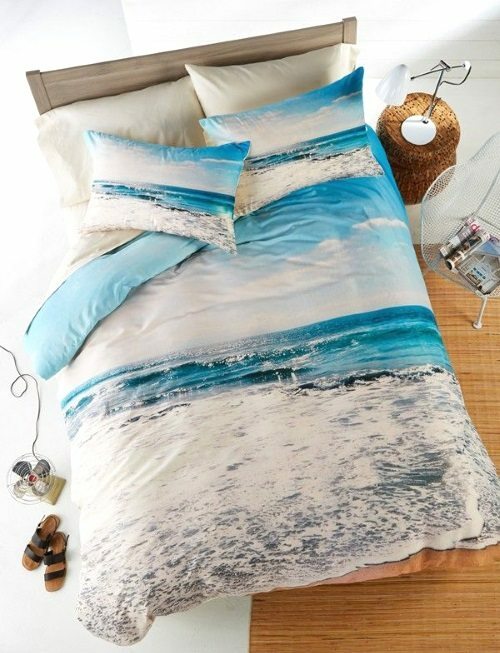 This Ocean Beach Bedding by Dany is called Take me There. Yes please! A lovely airy Sea Cottage Comforter Set from Bed Bath and Beyond. 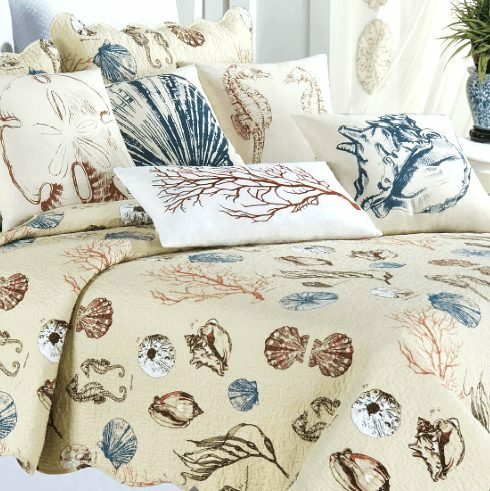 You get the sandy beach and all its treasures with the Historie de la Mer Quilt Set from Amazon. 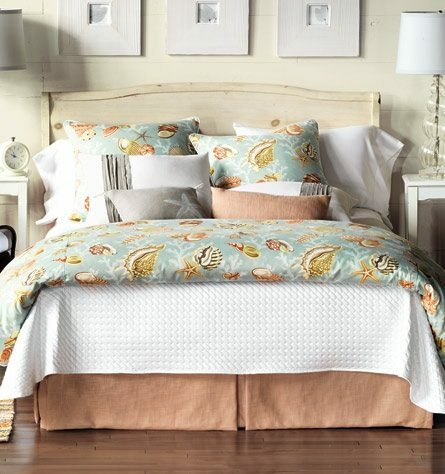 And more sandy hues with a Summer Beach Duvet Set from Caron’s Beach House Bedding Collection. 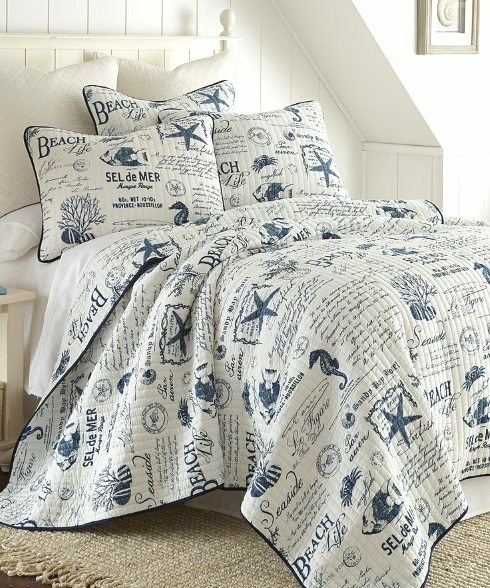 Beach Word Bedding with a French Twist on sale at Zulily. Offer ends 9/17. Slip away to a beautiful Greek island. The Echo Mykonos Comforter and Duvet Cover Set is reminiscent of Grecian architecture. The muted aqua blues are surely blissful. This is another closeout sale at Macy’s. Or bring the fairytale charm of Italy’s most popular Beach Town on the Amalfi Coast to your home with the Positano Bedding Collection. 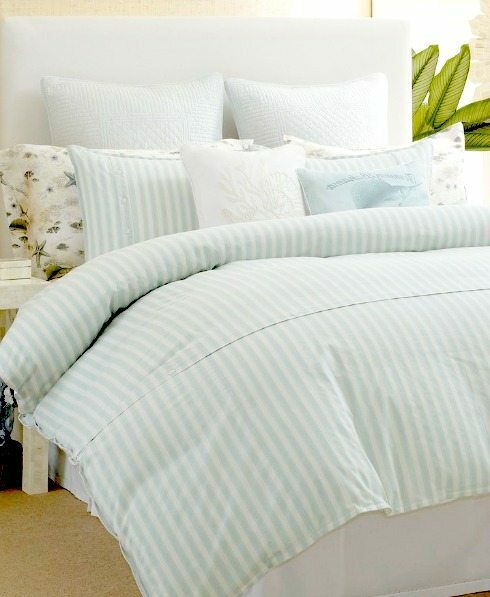 Sweet dreams guaranteed with all these beach bedding collections! where can I buy the last set posted? There doesn’t seem to be a working link. Laura, the link for the Positano Bedding (last set) is working when I click on it! Click here! Some really lovely fresh bedding ideas there. I think my favorite is the striped one but I do like the “Beach” Pillow. Thank you for sharing.